In October 2010, when these photos (below) were taken, visitors were not allowed in the church because of reconstruction work. 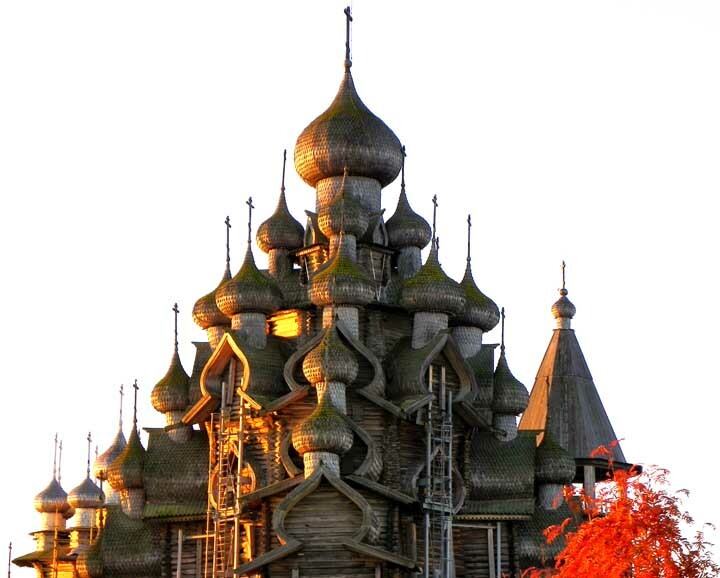 The Pogost includes The Church of the Transfiguration of Our Saviour, The Church of the Intercession, the Bell Tower, and Graveyard. AKA: Summer Church The church was not designed to be heated and was used for services only during the brief northern summer. Structure: Octagonal log framework called "vosmeric," with an annex facing each of the cardinal directions. The large, base octagon carries on it two successively smaller octagons at higher elevations. 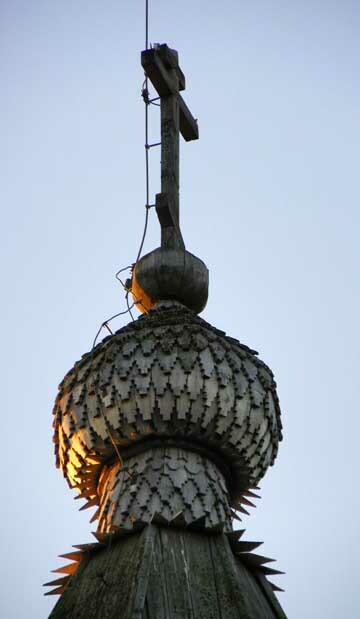 Each of the upper octagons is supported on the octagon below by a series of "tetrahedron beams" and also stabilized by hidden, inclined struts. Structure: The church is set on a loose-rock foundation according to dry-stack wall technique; rubble work was added only under the western narthex in 1870. 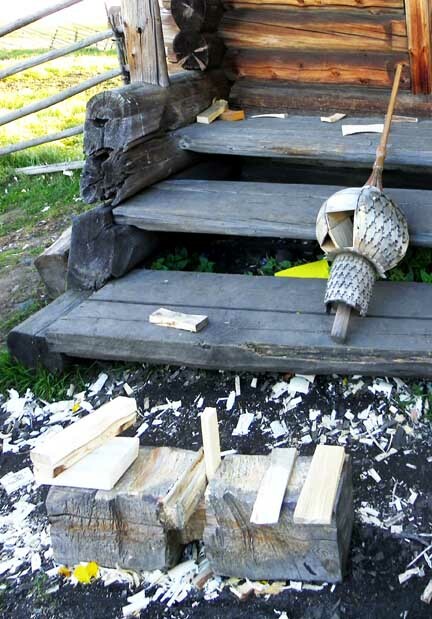 The logs of exterior walls are notched at the corners according to the traditional method with the log ends protruding or extending beyond the corners of each wall ("v oblo"), while the corners of the interior walls were built according to the traditional method with the log ends not protruding beyond the corners ("v lapu"). 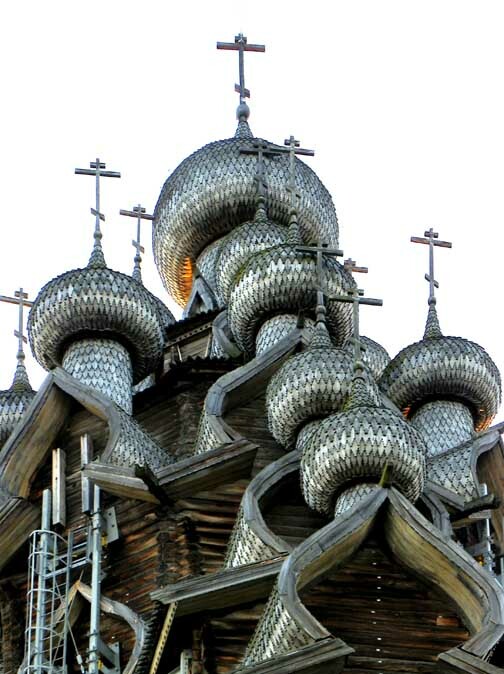 History: Contrary to the later, domed churches of the pogost, the first ones had pyramidal roofs. 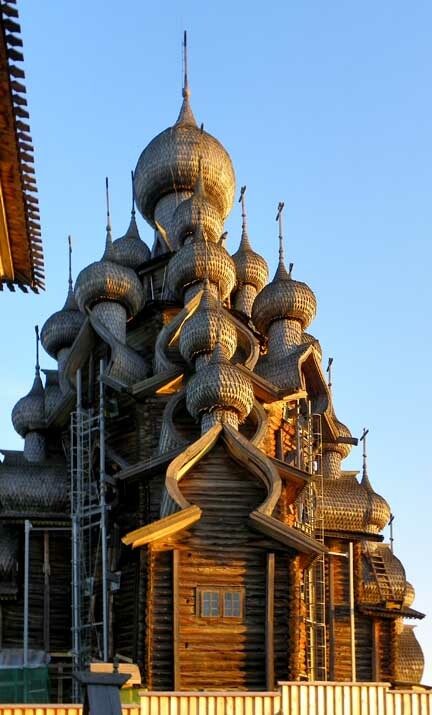 Onion domes: Crowned with 22 onion-shaped domes/cupolas built on a cascade of barrel-roofs of the annexes and octagons. The shape and size of the domes vary from tier to tier. The domes are raised on cylindrical necks and mounted on curved roofs. 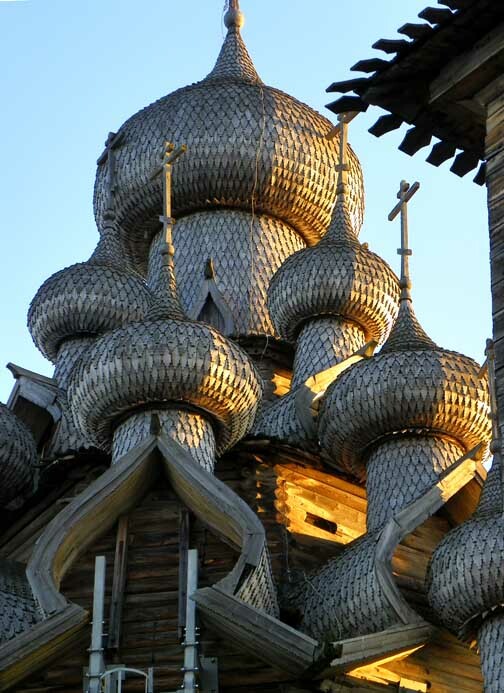 Onion domes: Domes are covered with thousands of hand cut aspen shingles, each of which was individually shaped for its location. 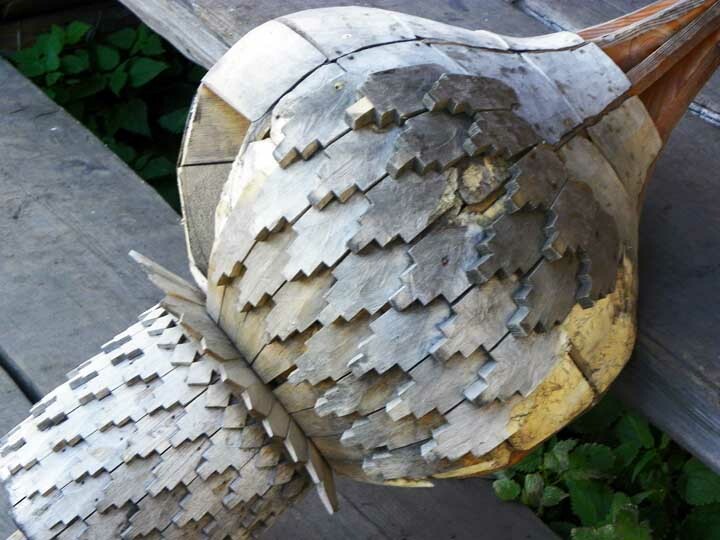 Aspen was used because it was easily worked with a hand ax and it did not warp. The aspen wood reflects a myriad of hues changing the color of the cupolas depending on the light. Structure: Erected without any nails or other metal. Structure: Flat roofs are made of spruce planks and the domes are covered in aspen. The simple way to determine if a building in Russia is arch is to look for the top Eastern Orthodox cross. 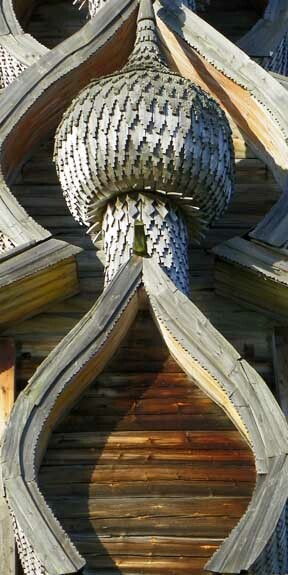 Onion domes are made from aspen trees. They are popularly believed to symbolize burning candles. Arch is a unique(?) variation of a lancet or ogee or horseshoe arch.